Some company would like to restrict users' wallpaper. 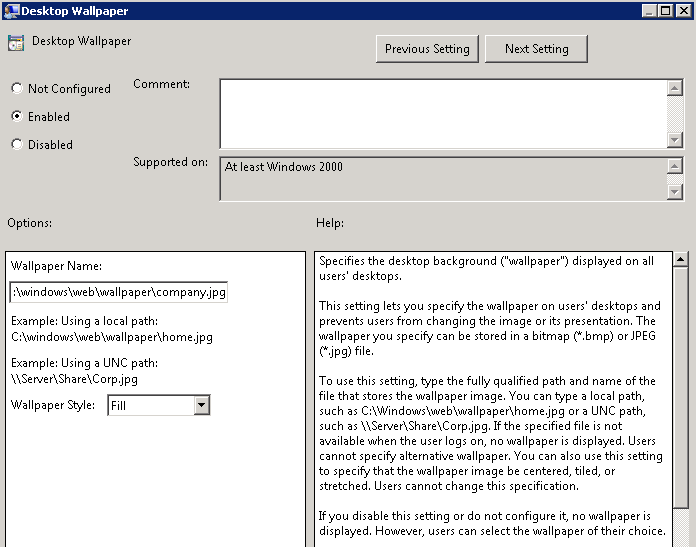 Administrator can use group policy to fullfill the above requirement. Assuming that Windows Server 2008 or above is the domain controller in our environment. If you are running Windows 7 or Windows Server 2008 R2 pre-service pack 1, you have to install a hotfix KB977944. 1. At domain controller, log in as Domain Administrator. 2. Launch "Group Policy Management Console". 3. Expand "Forest > Domains > <Domain Name>", right-click "Default Domain Policy", select "Edit". Remark: At production environment, you should use another group policy to assign this setting. 4. 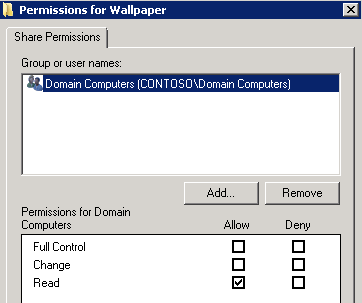 Expand "User Configuration > Policies > Administrative Templates > Desktop > Desktop". 5. At right pane, double-click "Desktop Wallpaper". 7. Next to "Wallpaper Name", type "C:\Windows\Web\Wallpaper\company.jpg". 8. Next to "Wallpaper Style", select "fill". Remark: Simple put using a UNC path puts a lot of stress on network as it has to download file every time the wallpaper is loaded. It also means that if the network path cannot be contacted when the user logs on all they will get is a black background wallpaper. 10. 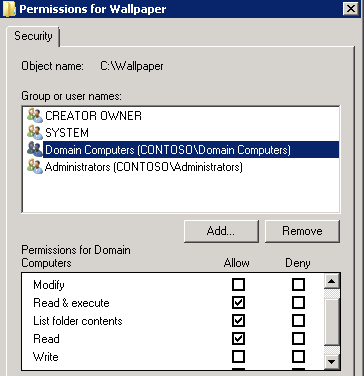 Still in "Group Policy Management Editor", expand "Computer Configuration > Preferences > Windows Settings > Files". 11. Right-click "Files", select "New > File". 12. Next to "Source file", type "\\<File Server>\wallpaper\company.jpg". 13. 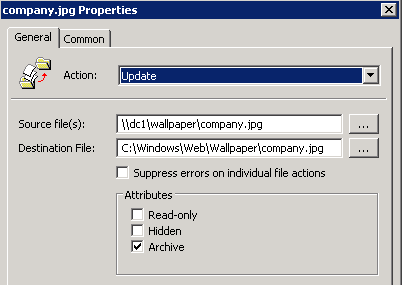 Next to "Destination File", type "C:\Windows\Web\Wallpaper\company.jpg". Remark: Make sure the "Action" is set to "Update". 15. Close "Group Policy Management Editor". 16. 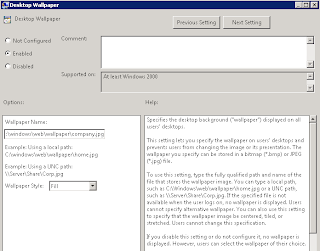 Launch "Windows Explorer", create a folder which is named wallpaper in C:\. 17. 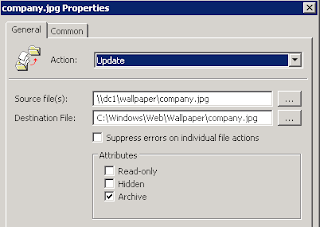 Right-click "Wallpaper", select "Properties". 18. Select "Sharing" tab, click "Advanced Sharing". 19. Check "Share this folder". 21. 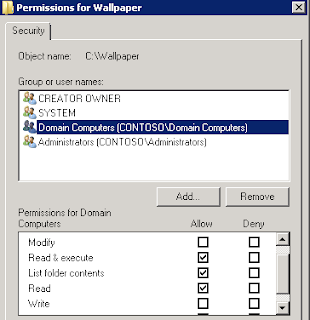 Remove "Everyone", add "Domain Computers" and assign "Allow - Read". 23. Select "Security" tab, click "Edit". 24. 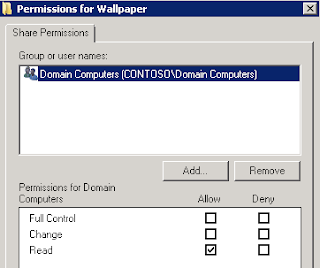 Add "Domain Computers" and assign "Allow - Read". As a result, all workstations will be forced to use company.jpg as the wallpaper.